Just a quick note before this post starts, my sister Sue tells me that a programme on TV called “Spectacular Spain with Alex Polizzi” has been on TV in NZ recently and she had just watched an episode on Jerez and Seville. I found the programme on YouTube…it’s episode 4. We shall now have to watch the rest of the series to see what we have missed and what shall go on the agenda for the next trip. After our successful trip to Jerez, we had planned to spend the following day checking out some more of the sights around Seville but first we needed to take a quick trip to the train station to book and collect our tickets for the following day to Granada, our next destination. Granada tickets were quickly sorted however, whilst we were at the station, we asked purely out of interest how long would a trip to Córdoba take? 45 minutes by fast train we are told, if you want to go, there is a train leaving in 6 minutes…yes please, we said and book us a return ticket as well please. Tickets in hand we hurried to the correct platform with a couple of minutes to spare…talk about spur of the moment decisions! !, this time we had to go through a security check as well, a first so far on our train travels. Córdoba, like many other Spanish cities, has an Anglicised name of Cordova, and is yet another magnificent city with a rich history encompassing many cultures. As well as being a traditional centre for silk manufacture, it was also a centre of education with universities and medical schools particularly during the Muslim reign from the 8th century through to 1236 when the Christians took over. Córdoba can also lay claim to have the highest summer temperatures in Spain and Europe, with average high temperatures around 37 °C (99 °F) in July and August, however for us it was a pleasant 26C. Our train journey took us past kilometres of orange trees, then olive trees but as we got closer to the city another change in trees with what we thought were apricot trees with their autumnal colours resplendent but on reflection we think they were more likely to be almond trees. 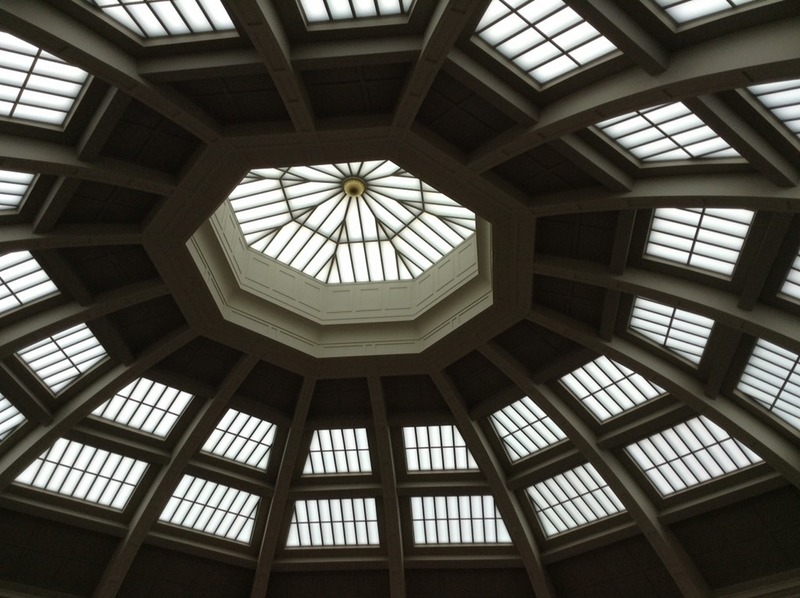 Córdoba station was a larger station than we anticipated and a very modern building to boot. We found an information centre within the station and bought ourselves tickets for the hop on-hop off bus which just so happened to have a stop right outside. Perfect. 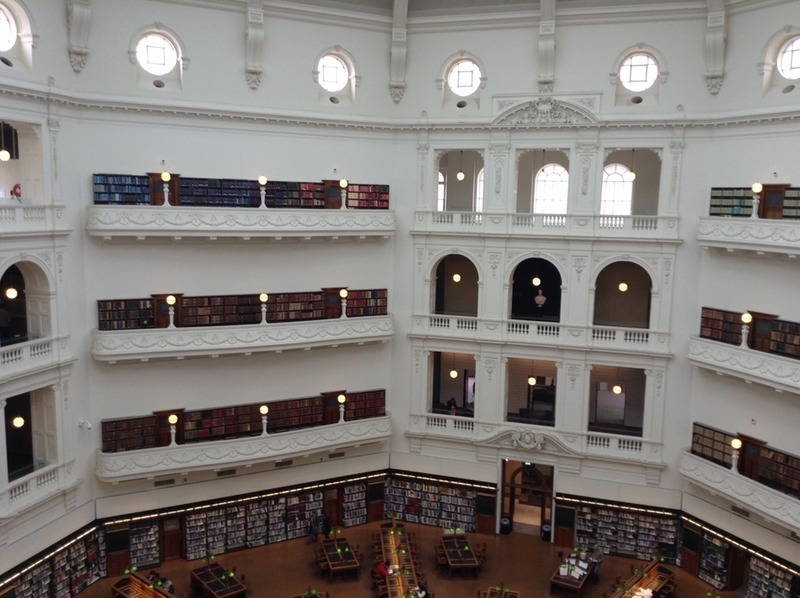 We had a great tour of the city and we surmised that we could have come and stayed here for sometime to explore everything in depth however an overview would suffice this time. Lots of pictures to follow. the view from the top of the bus as the driver carefully and skilfully negotiates the narrow streets. In some streets pedestrians had to stand in doorways to let the bus through, in others, shopkeepers had to roll in awnings so that the bus did not hit them. Bridal party at Puerta del Puente or Roman Gate by the Roman Bridge. Roman bridge over the Guadalquivir River, you can see the gate and the mosque in the background. This was the main access point to the city, across the bridge and through the gate. Overlooking the Roman Bridge and next to the Mosque-Cathedral is the Triunfo de San Rafael column, the most elaborate of many devotional columns and images in Córdoba commemorating the Archangel Raphael’s promise to protect its inhabitants. horse and carriage ride anyone? Christmas decorations over the shopping streets of Córdoba. Although decorations are being put up all over Spain, none are yet illuminated, this does not happen until December. anyone for a helter-skelter ride? Seen in one of the streets in the centre of Córdoba. Córdoba is one of the few cities in the world that has a near-exact antipodal city, namely Hamilton in New Zealand, but surprisingly the cities are not twinned. We wandered the back streets admiring the sights however our time was running out so with a quick sprint via taxi we were back at the train station ready to return for our last evening in Seville before tomorrow’s journey to Granada. Another very pleasant train journey from Huelva to Sevilla, this time passing through what seemed like thousands of acres of oranges and olive groves as well as vegetable crops and glasshouses. We must say that the Spanish do know how to do train travel, with comfortable seating, plenty of room and up to date information on the screens. As you can see we were heading to Sevilla Santa Justa, travelling at 136km/hr at that moment (it did get up to 165kph), the temperature a balmy 25C, this was about two thirds of the way through our trip. We arrived at Sevilla main train station and caught a cab to our lovely apartment where our host Antonio greeted us and showed us in. We are staying again right in the centre of town in an older apartment block that is just three stories high and set around a large central courtyard, very Moorish in its design. After our quick familiarisation, it was a trip to the supermarket to get some basics before we headed just 50metres along the road to a local tapas bar that Antonio had recommended, as he said it was a place that he ate at and mostly locals frequented, sounds perfect. All the tapas plates were priced at around the €2.50 mark, we made a few choices and waited to see what would be presented. But first a note about prices, we tend not to compare costs to NZ dollars, we have Euro€ and think of everything as 1 NZ$ equaling 1€ or 1£. The only time we compared prices was in Switzerland using the Swiss franc but even then we compared the franc with the euro or the pound. It’s all about when in Rome…. now back to the tapas! my goodness, how delicious were these dishes! Sardines, peppers, tomatoes, patatas bravas, pate, deep fried goats cheese and croquetas. Vowing to return again soon, we made our way home for the evening. A tour around the city was in order for the following day to familiarise ourselves with Sevilla and where we would want to see in greater detail later. But first of all the early riser headed to the local market for a look, and yes I did visit the market with him later in the morning. The array of fruit, vegetables, meat and fish was impressive, especially the fish roe which reminded us of Gary who we know loves eating this delicacy as whenever we have been fishing with him and there is roe in the fish, it is quickly put to one side for a delicious treat to be cooked up later. Hmmm, one thing I am not particularly keen on is snails. Off now for our trip around Sevilla to see the sights. Sevilla has a long and varied history being settled by the Phonecians, then Romans, Arabs and then Christians with all of these cultures having an influence on the city in both the architecture as well as the people. Clockwise from Top L: Torre del Oro, Giralda, Arenal (bull fighting arena), Maria Luisa Parque buildings. Clockwise from Top L: The wide open boulevards lined with orange trees, Costurero de la Reina, the Guadalquivir River, La Palmera. It was hard to choose just a few buildings from all the photos we have but we have to stop somewhere. There really is a variety of styles, cultures and even materials used in construction but what it has started to show is how little we know about the rich long history and culture of Spain. Something I need to redress. At the end of a long day of sightseeing what better way to end it than with churros and hot chocolate. On our way back to our abode we stopped to have a look at the new “mushroom” structure recently built in the centre of Sevilla, or Metropol Parasol as it is officially known. 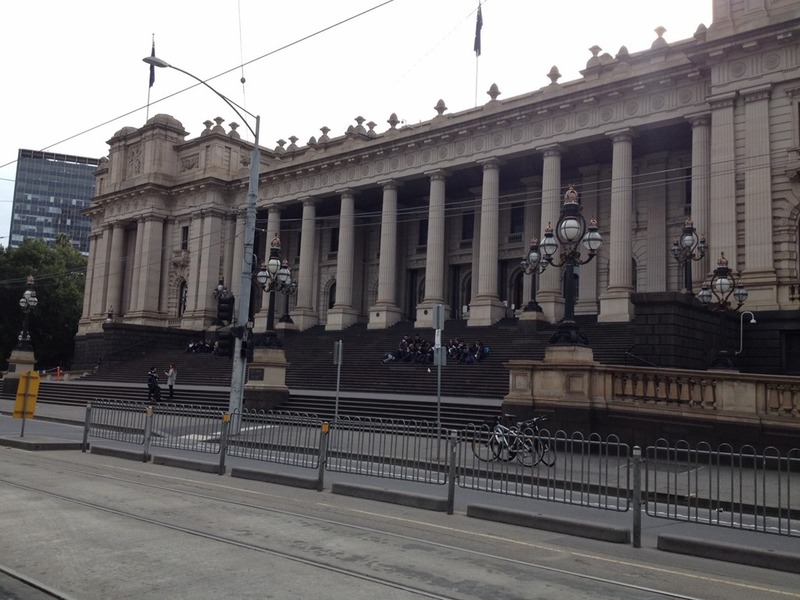 it certainly is an innovative and interesting structure in amongst the old buildings. Apparently it is the largest wooden structure in the world and was finally completed in 2009 but not without controversy in design, construction, technical difficulties and of course budget overruns. We arrived back at our apartment in time to freshen up a little ready to go out to Coloniales, the tapas bar where we are becoming known. Again we tried a few more tapas from the extensive selection, enjoying every single selection. Just as we had finished our meal and asked for our bill, our waiter said no, no, no….wait please, and then presented us with a complimentary local liqueur made from cherries! We had a few hours spare before we had to catch our train to Faro. After checking out of our apartment we headed into town dragging our cases behind us, not sure on how we would fill in the time. However, we came across a line of Tuk-tuks and decided to have one last look around Lisboa putting ourselves into the capable hands of our guide Miguel. Miguel listened to where we had already been and came up with a personalised tour for us, taking in sights and scenes we hadn’t visited as well as promising to show us the real Lisboa and it’s people. True to his word we were quickly on our way through back street climbing to the highest point in the city for a panoramic view. looking across to the castle and just below it on the right hand side was where we had been staying. Yes, we were perched on the side of a hill! We visited churches and buildings that Miguel thought were interesting (and yes we did too). During our tour and subsequent discussions, Miguel figured out that we were interested in the real Portugal and not the touristy stops and shops. We mentioned that we had not bought any souvenirs as such as we were not into buying Chinese made imitation bulk stuff that seemed to be everywhere. Later, he passed by a wee shop that he said was an example of the real Portuguese art made locally, by local artisans, including a professor of art history who was recreating patterns and styles of long ago. I asked if we could go back to it as I would like to have a look, needless to say I came away with a small couple of items with the knowledge that my spend was going to local people and supporting their craft. As we were outside one of the churches with Miguel explaining the history to us, he said, “look, see those two there? they’re pickpockets!” Two well dressed and tidy men in their late twenties or early thirties looking all the bit like tourists themselves with small backpacks and phones at the ready taking pictures, they were ever so nonchalantly following two women with large cameras and backpacks. Hmmm….not the image of pickpockets that I had. Miguel called out to a local workman further up the road something about the pickpockets and finding a policeman. We left at that stage, hopefully they were thwarted in their attempts. We had also arranged for Miguel to drop us off at the train station rather than back in the centre of town, on approaching the station he asked if we would like to visit a local market in a suburb close by that was an area he knew well as he had previously had bakeries there. Sure, we both said, we would love to see where local people shop for their produce. 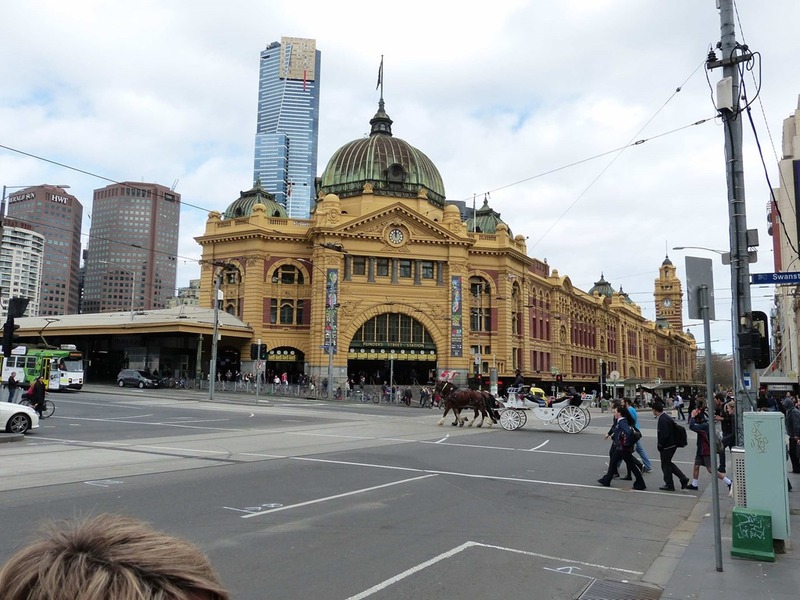 We were soon in a market reminiscent of a small version of the famous Melbourne Victoria market. This is what we have been looking for! Shame it was on our last day in Lisbon. and a short time later we hopped onto the train bound for Faro. We had seen the bridge and statue many times from Lisbon and now we were travelling over the bridge, or under the bridge, as the rail line runs underneath the road. On through the countryside we travelled, passing through thousands of cork trees as well as some olive groves, no pictures were taken during this journey! The one thing I will say about Portuguese trains is that the seating configuration leaves a lot to be desired with no account taken for where seats are positioned in relation to the windows for viewing vistas. Both times so far we have been seated by a pillar, one time facing backwards as the seating pattern seems to have been done randomly. The three hour trip passed relatively quickly and we were soon disembarking in Faro. We followed the instructions on how to reach our accommodation and within 5 minutes we were met at the door of our apartment by Vera, our host. We really have done well with picking apartments, this one is just delightful, two bedrooms, lounge dining, kitchen and laundry and comes complete with an enclosed courtyard. It is very clean and tidy as well as thoughtfully appointed. We arrived just on dusk so after our orientation we quickly settled in then it was off to find a few provisions and something to eat before setting in for an early night. Tomorrow is set to be another busy day. 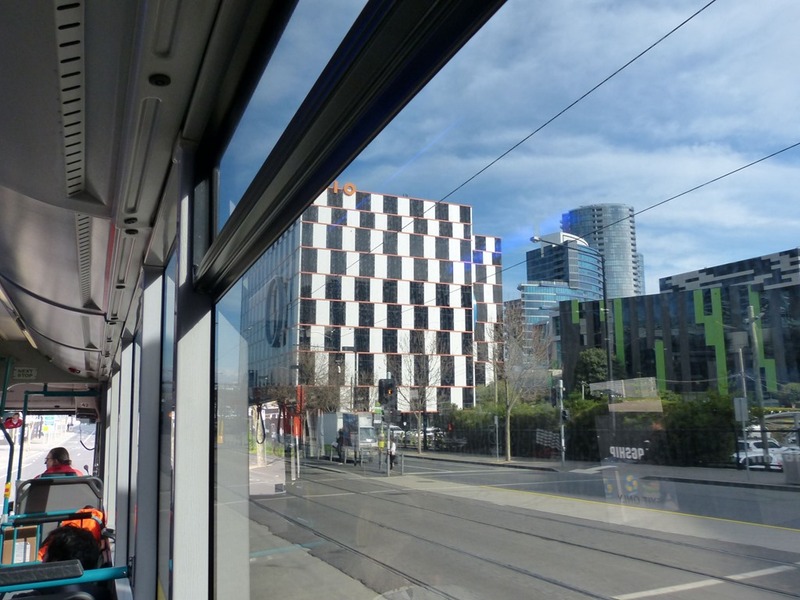 Their is a planning rule in Melbourne that states that no new build (Office or apartment) in the greater Melbourne area can be built the same colour, shape or clad in the same material as any other. This makes for very interesting and varied architecture with old mixing in with new seamlessly. The above building is an optical illusion giving the impression that all the floors are on different angles, which is very effective. 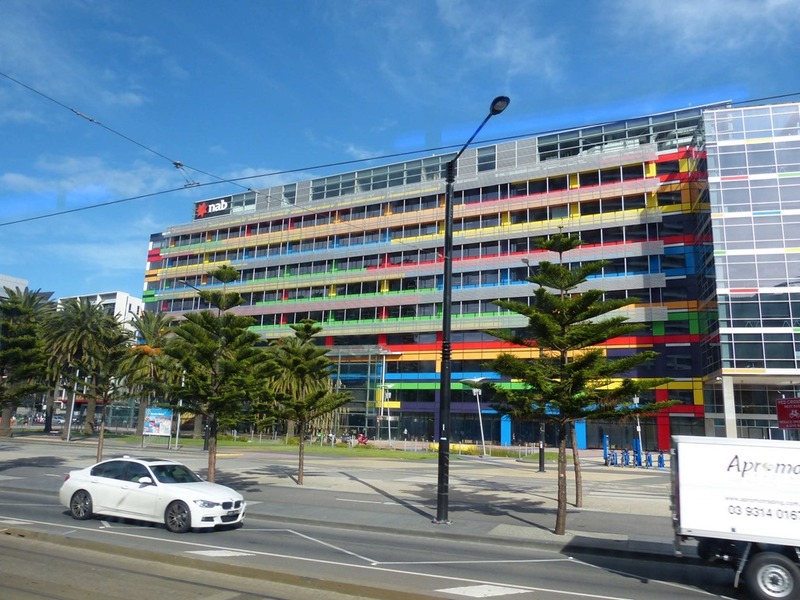 Colourful building in the Docklands. 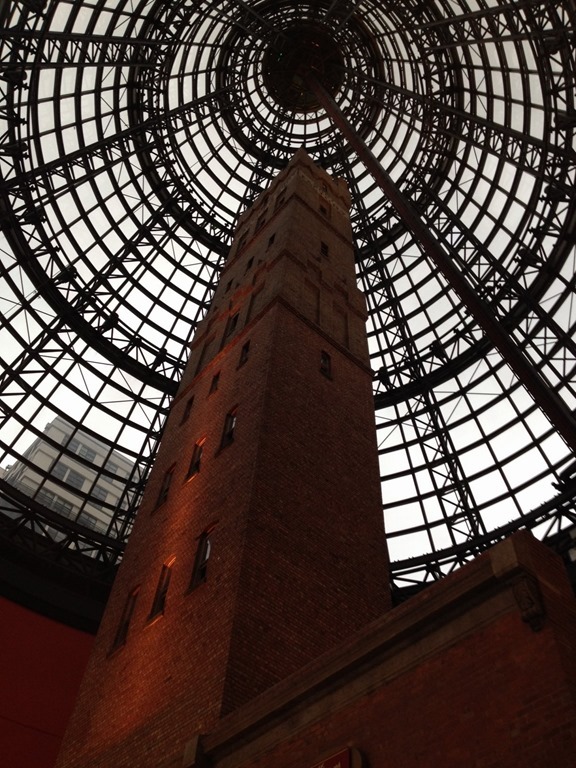 This what you do with an old shot tower, enclose it under a dome and build a shopping mall around the base. 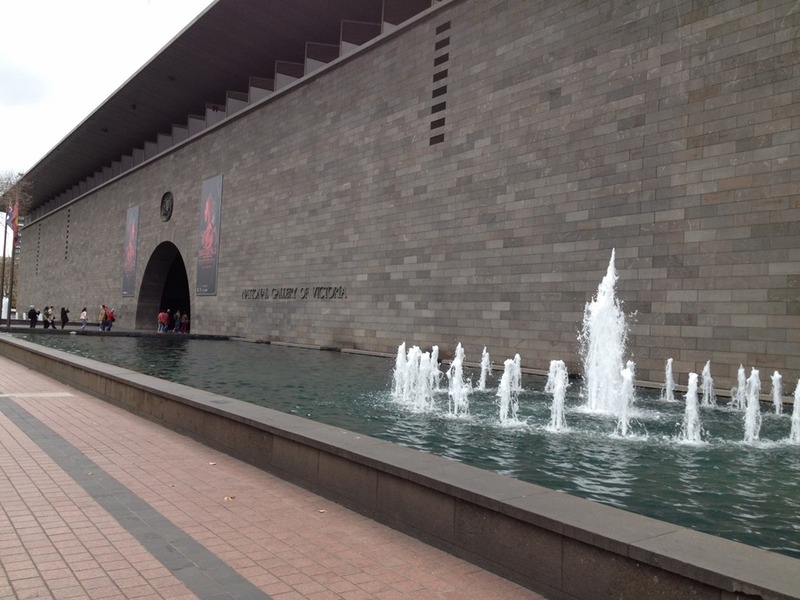 National Art Gallery which had an exhibition of the Masterpieces from the Hermitage. As we had previously had a fabulous tour of the Hermitage (see here), we spent time at the other excellent exhibitions. Performance centre next to the Art Gallery, this is supposed to represent a ballerina’s tutu?! 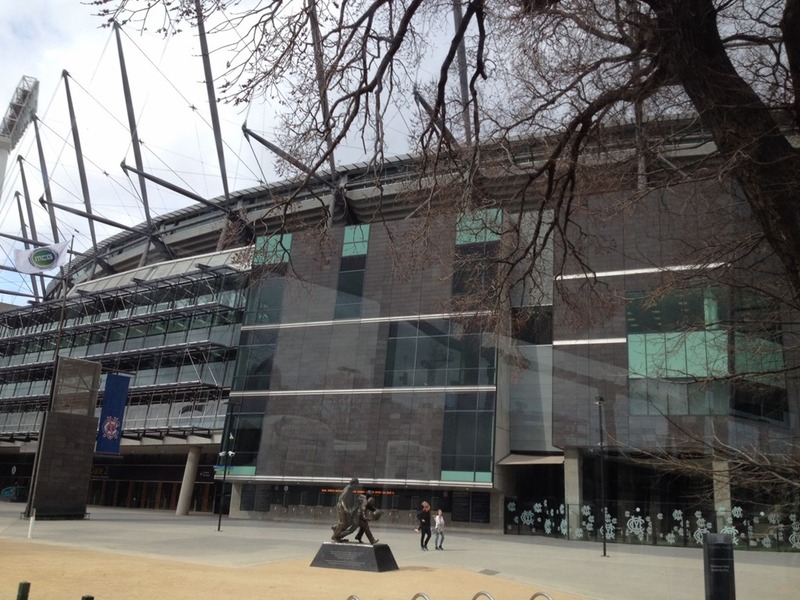 the famous Melbourne Cricket Ground or MCG or “the G” as locals call it. 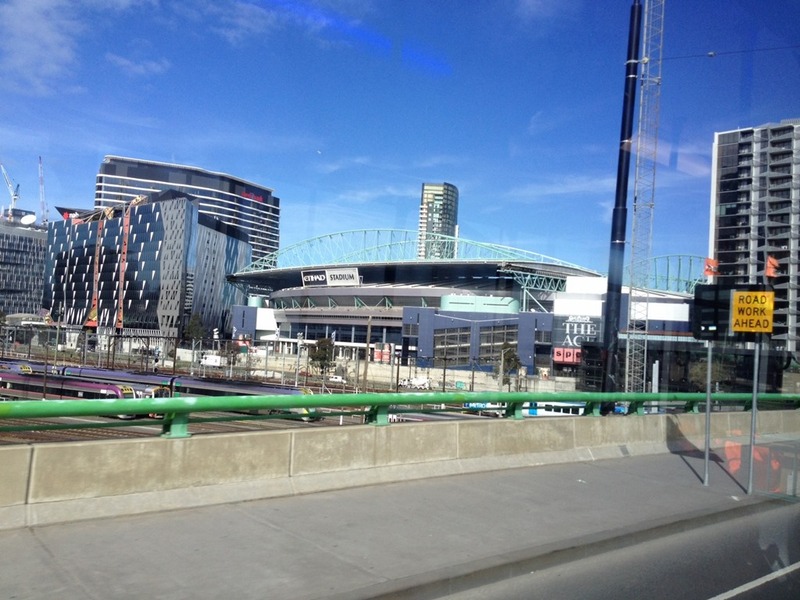 Used not only for cricket but also AFL (Australian Rules Football), with seating for around 100,000 people. 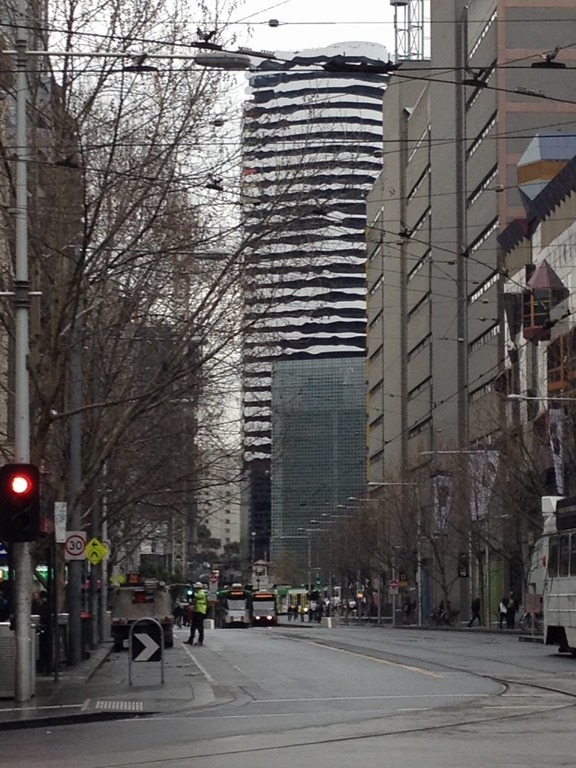 Eureka Tower is named after the Eureka stockade, a rebellion during the Victorian gold rush in 1854. This has been incorporated into the design, with the building’s gold crown representing the gold rush and a red stripe representing the blood spilt during the revolt. 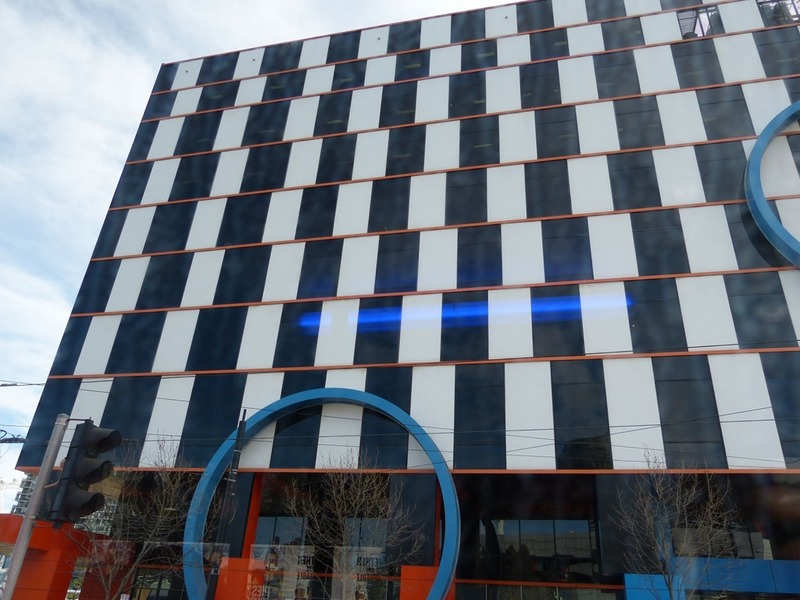 The blue glass cladding that covers most of the building represents the blue background of the stockade’s flag and the white lines also represent the Eureka Stockade flag. The white horizontal stripes also represent markings on a surveyors pole. 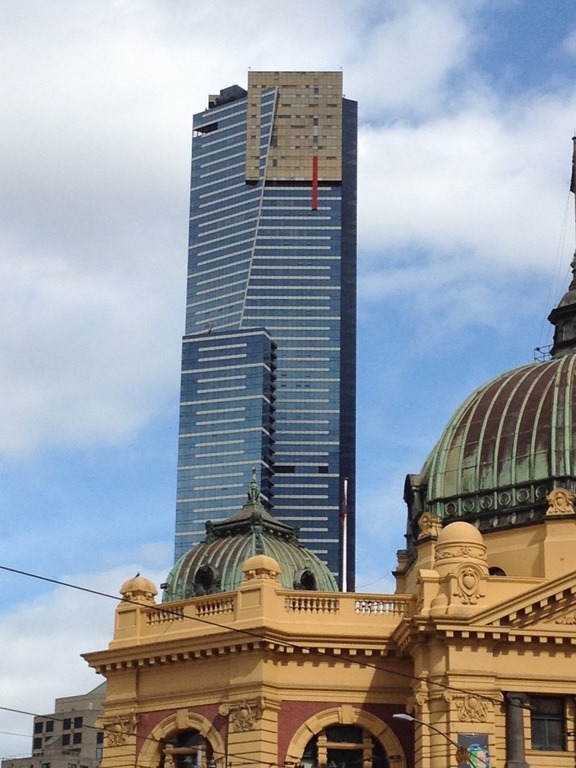 When measured either by the height of its roof, or by the height of its highest habitable floor, Eureka Tower was the tallest residential building in the world when completed in 2006. It is also currently the building with the most floors available for residential occupancy in the world. The building stands 297 metres in height, with 91 storeys above ground plus one basement level. There is an observation deck on the 88th floor with a glass cube called The Edge a glass cube which projects 3m out from the building with visitors inside, suspended almost 300m above the ground. When one enters, the glass is opaque as the cube moves out over the edge of the building. Once fully extended over the edge, the glass becomes clear …and no, we did not go up, all of us have a certain nervousness associated with heights, some are more extreme than others! 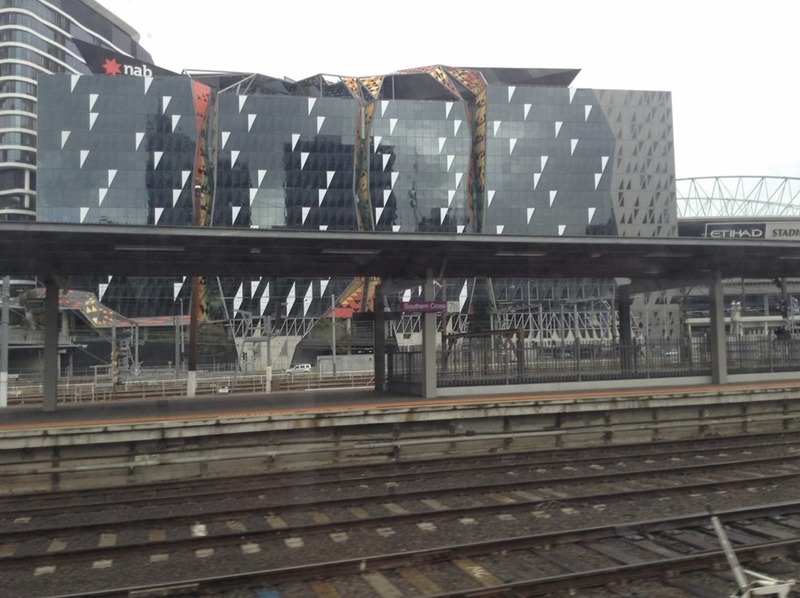 Another colourful building seen from the train. 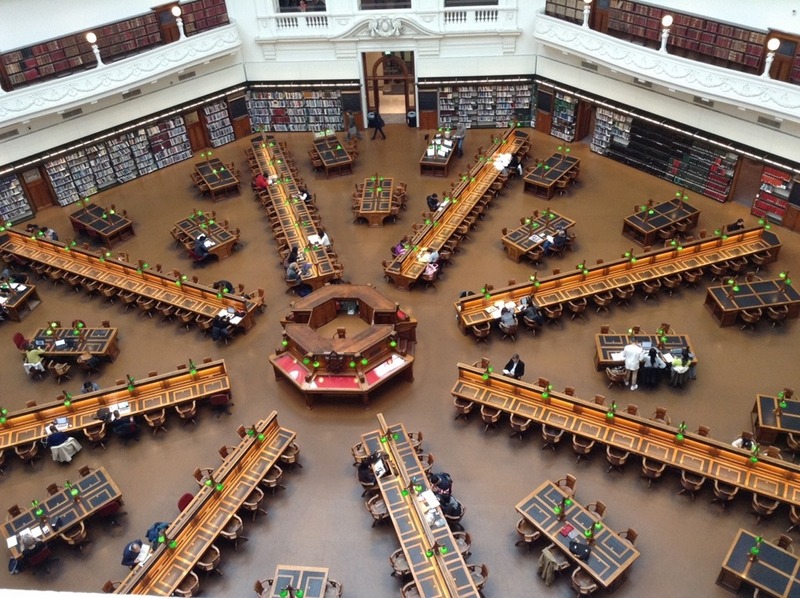 The impressive Dome reading room in the National Library, with galleries all the way around the octagonal room some displaying exhibitions, with the glassed dome at the top. 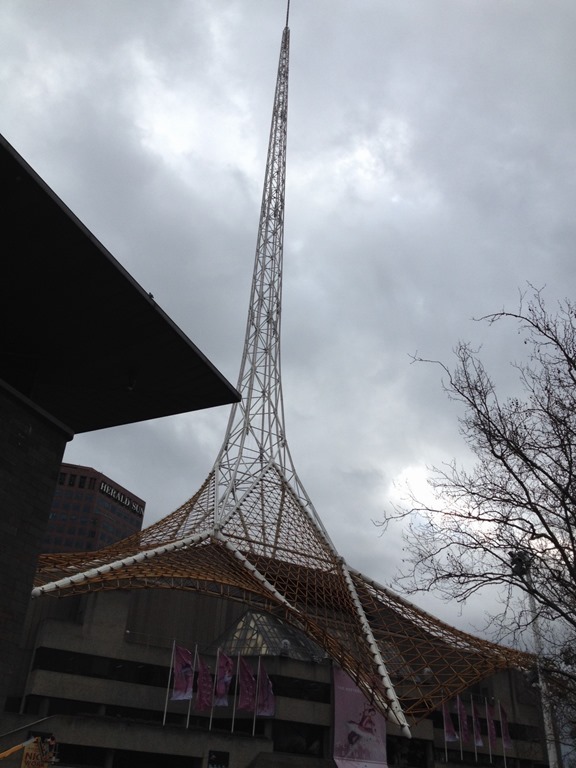 There are of course many many more interesting buildings in and around Melbourne, these are just a selected few.